Gerbera daisies are also known as African daisy and belong to the sunflower family. These brightly colored flowers are native to South America and grown as a perennial plant in growing zones 9 to 11, while outside of these zones it can be grown as an annual. Gerbera daisies are known for their large, 4- to 5-inch-wide flowers with two rows of petals that surround a dark prominent center. They bloom from early summer into fall attracting birds, bees, and butterflies, while being deer resistant. Growing gerbera daisies in your garden requires minimal care and will reward you with beauty throughout the summer. Select a growing location that receives full sun daily. Some afternoon shade is preferable in climates with constant temperatures over 80 to 90 degrees F.
Prepare the soil in early spring as soon as the ground is workable. Rake or till to break up the ground making the soil loose. 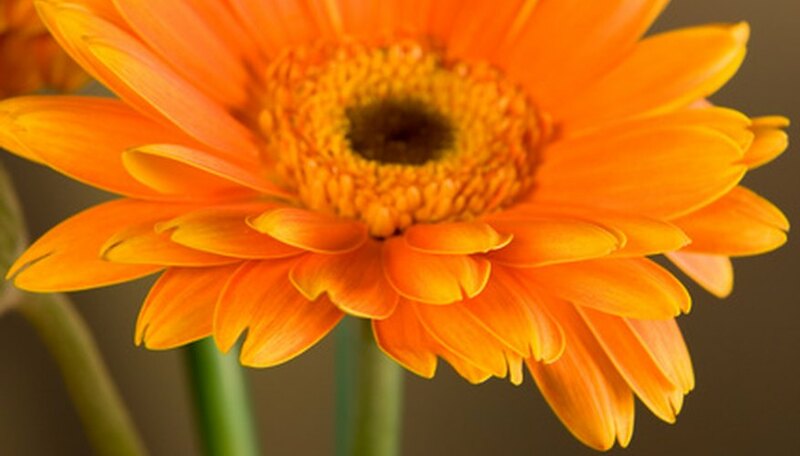 Gerbera daisies prefer a slightly acidic to neutral soil with a pH of 6.1 to 7.5. If needed, compost or peat moss can be added to the soil before planting to make a well-draining soil. Dig a hole twice the width and depth of the root ball, spacing plants about 12 inches apart. Set the plant into the hole with the top of the root ball level with the ground surface. Fill in the hole with soil and tamp down firmly around the base of the plant. Water well after planting using a drip irrigation system or a garden hose with the water trickling out slowly. Water regularly two to three times weekly to keep the soil evenly moist during the active growing season. Adjust the amount of water your plants receive when the weather is warmer and the soil dries out quicker. When they're not blooming, let the plants dry out slightly before watering. Feed your flowers with a water soluble fertilizer every other week. Fertilize only during the active growing season when the flowers are blooming. Water in well after applying the fertilizer. Cut flowers and bring inside for colorful flower arrangements. Do not plant your gerbera daisy too deep in the soil or it can develop root rot. Do not overwater leaving standing water on the ground around the base of the plant. Do not fertilize during the winter time.